I Watched Up in the Air few weeks ago. I loved the movie. While I was ruminating about the film, I felt I wasn't going beneath the surface of this tragicomical film at the first glance. It took few random viewings to savor the whole movie in totality and reflect on what the movie told about our connected lives. Up in the Air is an interesting commentary about our modern, networked lives and the role technology plays in relating with others. 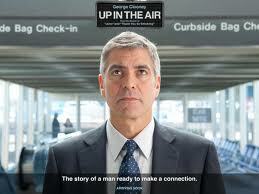 Up in the Air begins with a montage of beautiful aerial shots with the opening credits floating over the clouds. If you come to think about it, the artificial environment of the airport with its "the recycled air, the artificial lighting, the digital juice dispensers etc," resemble the digital landscape around which companies and individuals carefully craft their identities meticulously. Up in this digital space, every body hovering around seems to be warm, friendly and social. Companies are humane, social entities which care deeply about their environment. Relationships in this space is all about having the highest number of friends/followers. Customer Loyalty is all about collecting the maximum number of loyalty points/frequent flyer miles. As much we would like to bring surrogates or approximations to delude ourselves from reality, we are simply beguiling ourselves to believe that we have naively found simple solutions for our complex problems. Technology with its ubiquity often brings about a delusion where we think we are surrounded by people. Not everyone gets a chance to realize, as Farmiga points out to George Clooney,how isolated our lives are indeed in reality. While I am typing this, I am reminded of a billboard advertisement I noticed for a mobile service service in Pune, which points out in big, bold letters, "Alone but not lonely",with a picture of a man happily engrossed over a phone call. I often wonder curiously, if it could be the other way around in reality, "Lonely, but not alone". Ofcourse, marketers wouldn't like us to realize this. The movie also beautifully depicts the location paradox inherent in this Connectivity age. As Emily Nagle Green explains in her book, Anywhere, location is both significant and insignificant in this networked age. Isn't it insignificant when we can communicate with a person from anywhere with help of one common network? If you think again, location becomes very significant as we have the choice to be where it matters the most, as in the case of firing someone,as shown in the movie. Technology is beginning to play a crucial role in the way we relate to people. Although the old-timers talk about superficiality of online relationships especially, when it is so easy to reach out to people, it is so hard to maintain close, personal contact in our attention deficit,hurried lives. While it would be foolish to go on a nostalgic trip to the good ol'days when technology wasn't a part of our social lives, ignorant of its immense benefits in our daily lives, we have to rethink the way we relate to people when we use technology as a tool. Often we tend to forget that technology is just a tool, and it lies upto the invidividual to bring about the human element vital for communication. No sophisticated technology whatsoever can humanize the communication for us. The onus lies entirely on us.